Buzz the astronaut has a close encounter with Zoff the alien! TECHNIQUES: All pieces are knitted flat on straight knitting needles. You will need to cast on and off, knit, purl, work increases and decreases, and sew seams. This pattern uses the long tail cast on, knitted cast on and the cable cast on. The astronaut pattern incorporates intarsia colour-work to make the helmet. 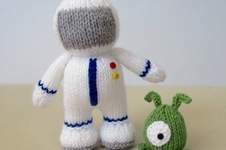 The blue stripes on the astronaut’s suit are added after knitting using Swiss Darning (or duplicate stitch) embroidery. FINISHED SIZE: Buzz is approximately 17cm tall and Zoff is 6cm tall.